On the fourth Wednesday of the month, we are all invited by Gail of Clay and Limestone to post about wildflowers for Wildflower Wednesday. 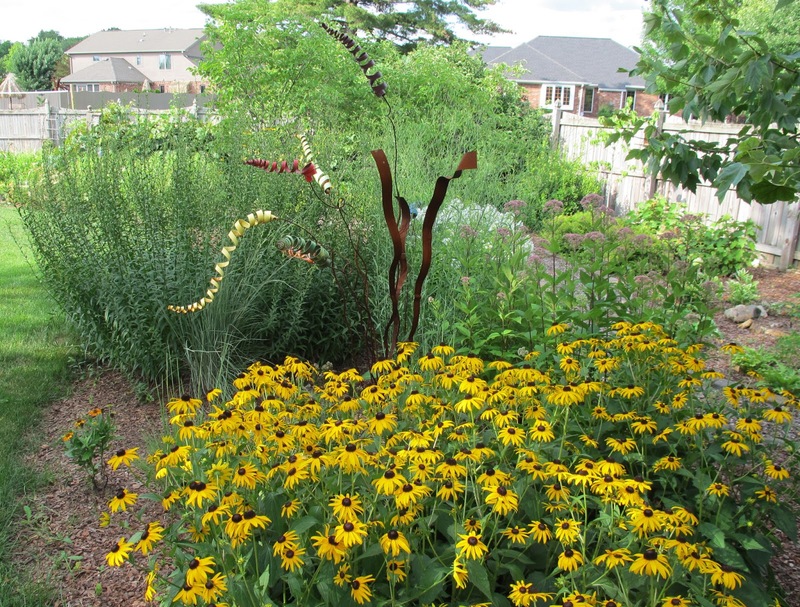 Gail organized this garden bloggers' meme to help promote planting wildflowers in our gardens and avoiding the use of pesticides so that pollinators and other insects can enjoy the flowers without harmful chemicals. For this month's Wildflower Wednesday post, I've developed a little play of sorts based on the following picture of Heliposis helianthoides, a wildflower that comes up here and there in my garden because I once planted a variegated variety, 'Loraine Sunshine'. 'Loraine Sunshine' is very good at self sowing but many of her progeny revert back to the species. That's okay, the species is a fine flower with its own merits. I like its carefree spirit. 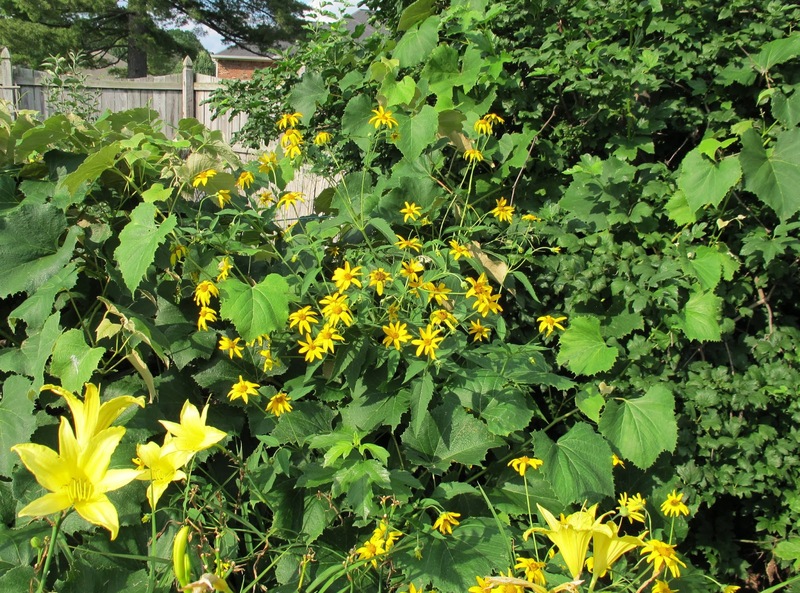 For my little play, the characters are Heliopsis, which has the daisy-looking flowers, Daylily, played by the variety 'Hyperion', Grapevine and the very large viburnum, Viburnum. The curtain is opening, let's listen in to the dialogue of the new play "Overheard in the Garden". Helopisis: (in a male voice) Hey daylily, are you photo bombing my picture? Daylily: (in a female voice) Your picture? I thought Carol was taking a picture of my beautiful flowers. If anything, you are photo bombing my picture. Besides, I was here first. Helopsis: You were here first only because Carol planted you here. I've heard the talk, you think the neighborhood has gone down hill since we wildflowers showed up. Daylily: You said it, not me. I only have this to say. I think you are here only because Carol was too lazy to pull you out. Helopsis: Well, I never... Grapevine, will you get off of me. For crying out loud. You are about to strangle me with those tendrils. Grapevine: (in a low, lumbering voice) Oops, sorry about that. I just get so excited in the summertime that I can't stop growing. Viburnum (in an old woman's voice): Speaking of grapevines, I feel like I have no privacy with that grapevine climbing all through my branches, and I think I just saw a clematis coming at me. Helopsis: Well, Viburnum, now that you mention it, it is kind of creepy to have a grapevine all over you. Grapevine, I'm warning you. Get off of me. You're crushing me. Daylily: Stop it. Everyone just be quiet. Can't we just get along? All this whining is affecting my bloom. Helopsis: Whining? We were just talking. Besides, I think you started it. Anyway, I thought you'd be happy to see me here. I'm a good little wildflower. Daylily: If you say so, but you aren't that little. Hey, wouldn't you be happier over there with your own kind in August Dreams Garden? Helopsis: Maybe, but it seems to be getting a bit crowded over there with lots of other yellow flowers. I like it over here. Daylily: But I'm yellow, too, or did you notice? Helopsis: I noticed, but I think our shapes are different enough that there is room for both of us here. Daylily: I agree. I'm sorry I said unkind things to you. Helopsis: That's okay. I'm sorry I photo bombed your picture. Now, could you help me get this grapevine off of me. Daylily: Sorry, I can't help you with that, I'm sort of rooted over here. Besides, that grapevine is heading for me now. We'll have to see if we can get Carol's attention to cut back some of it. I think she calls it pruning. Maybe she can get rid of some of my spent blooms while she is over here. They are ruining my pretty smile and general good looks. Grapevine (in the background): Pruning? Pruning! Oh, no! I don't wanna be pruned! 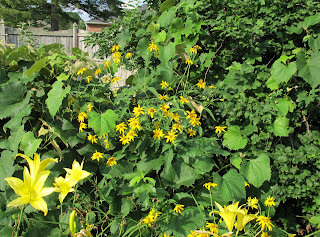 Heliopsis: Well, I don't want her to cut off my blooms. I see a nice spot over there in that other garden where I'd like to grow next year. I need to make some seeds! Daylily: Is that all you wildflowers ever think of, making seeds? I'm focusing on just being pretty. Make room for wildflowers in your garden! The other flowers and all the pollinators will thank you for doing so. Carol, Fabulous! I loved the conversation and the clever way you covered all the issues! You are good! xoxo PS Uhh oh! 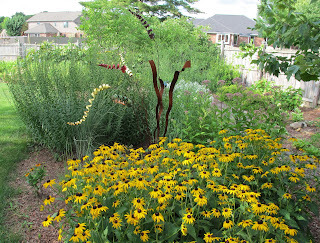 I planted a variegated heliopsis this spring, let's see what she does against the Susans! What an utterly delightful way to start the day! Thanks, Carol for having such an entertaining garden! Such fun, Carol--I always wondered what flowers must be thinking:) Now when is opening night for this production? How cute and they did apologize. No one wants to get their toes stepped on in the garden. Nice flower to have already picked out a spot for next year. I'm growing a variegated one called 'Sunburst'. I hope it will survive long enough to bloom. Yours are an inspiration.